Our Eyes are On You! – Connection! God’s Word tells us that God “opposes the proud, but gives grace to the humble” (James 4:6). How can we walk in humility before our God? By recognizing that humility puts us in a position to be able to receive from Him. As individuals, families, churches, communities and nations, we are in desperate need of a fresh touch from God… of hearing His voice instead of the clamor around us! We live in a society of “I’ll do it myself” mentality. However, there always comes a time when “self” just can’t do it anymore. Eventually, we realize that we are not God, but we are in desperate need of Him! That was the situation in Judah during Jehoshaphat’s day. An army from several nations was on the march against them. Outnumbered and in despair, they turned to God and fasted and prayed. Their fasting put them in a place of humility where they could pray the right prayer. Jehoshaphat’s prayer, after they had fasted, was not a prayer asking God to bless their efforts or to do what they wanted Him to do. Instead, it was an astonishing prayer of humility in which he said. “O Lord, we do not know what to do, but our eyes are upon you (2 Chronicles 20:2-12). Fasting brings us to a proper place of humility before God where we are able to pray such a prayer of faith and dependence. Grace-filled God, there is so much I want to know about You, and yet I continue to go off in a myriad of different directions rather than listening intently to Your still, small voice. Give me the strength to fast and pray so that I can lean deeply into Your heart and know You better. Teach me to overcome my flesh and all that distracts me. May fasting become a holy habit that strengthens my faith and puts me in a posture of complete dependence upon You. 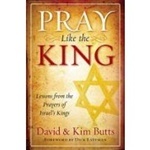 –Adapted from the article Why Fasting is Relevant for Today by Dave and Kim Butts, authors of Pray Like the King: Lessons from the Prayers of Israel’s Kings. This book is available at prayershop.org. Use the code CONPSP3 at checkout to receive an additional 10% discount.